Proprietary Name: Fluorometholone What is the Proprietary Name? Non-Proprietary Name: Fluorometholone What is the Non-Proprietary Name? Fluorometholone with NDC 70518-1929 is a a human prescription drug product labeled by Remedyrepack Inc.. The generic name of Fluorometholone is fluorometholone. The product's dosage form is solution/ drops and is administered via ophthalmic form. FDA Application Number: NDA016851 What is the FDA Application Number? 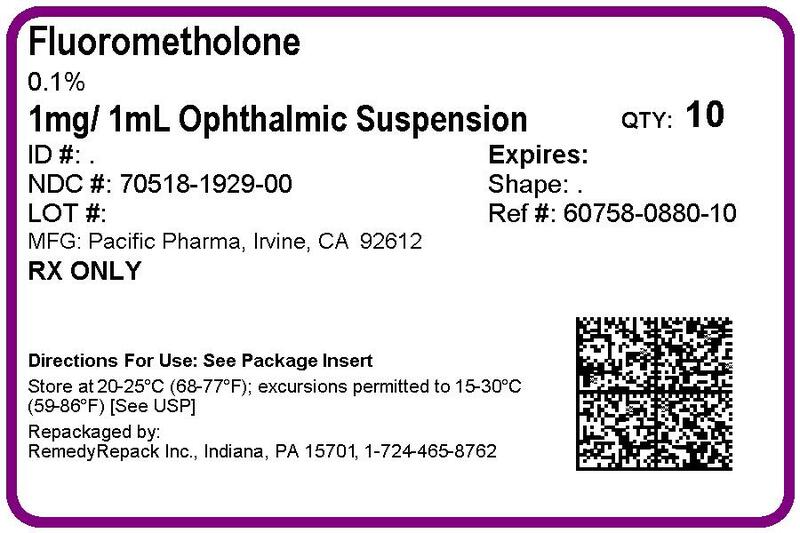 Fluorometholone ophthalmic suspension, USP 0.1% is a sterile topical anti-inflammatory agent for ophthalmic use.Chemical NameFluorometholone: 9-Fluoro-11β,17-dihydroxy-6α-methylpregna-1,4-diene-3,20-dione.ContainsActive: fluorometholone 0.1%. Inactives: edetate disodium; polysorbate 80; polyvinyl alcohol 1.4%; purified water; sodium chloride; sodium phosphate, dibasic; sodium phosphate, monobasic; and sodium hydroxide to adjust pH. Fluorometholone suspension is formulated with a pH from 6.2 to 7.5. It has an osmolality range of 290-350 mOsm/kg. Corticosteroids are capable of producing a rise in intraocular pressure. In clinical studies of documented steroid-responders, fluorometholone demonstrated a significantly longer average time to produce a rise in intraocular pressure than dexamethasone phosphate; however, in a small percentage of individuals, a significant rise in intraocular pressure occurred within one week. The ultimate magnitude of the rise was equivalent for both drugs. Fluorometholone ophthalmic suspension 0.1% is indicated for the treatment of corticosteroid-responsive inflammation of the palpebral and bulbar conjunctiva, cornea and anterior segment of the globe. Fluorometholone ophthalmic suspension 0.1% is contraindicated in most viral diseases of the cornea and conjunctiva, including epithelial herpes simplex keratitis (dendritic keratitis), vaccinia, and varicella, and also in mycobacterial infection of the eye, and fungal diseases of ocular structures. Fluorometholone ophthalmic suspension 0.1% is also contraindicated in individuals with known or suspected hypersensitivity to any of the ingredients of this preparation and to other corticosteroids. Prolonged use of corticosteroids may increase intraocular pressure in susceptible individuals, resulting in glaucoma with damage to the optic nerve, defects in visual acuity and fields of vision, and in posterior subcapsular cataract formation. Prolonged use may also suppress the host immune response and thus increase the hazard of secondary ocular infections.Various ocular diseases and long-term use of topical corticosteroids have been known to cause corneal and scleral thinning. Use of topical corticosteroids in the presence of thin corneal or scleral tissue may lead to perforation.Acute purulent infections of the eye may be masked or activity enhanced by the presence of corticosteroid medication.If this product is used for 10 days or longer, intraocular pressure should be routinely monitored even though it may be difficult in children and uncooperative patients. Steroids should be used with caution in the presence of glaucoma. Intraocular pressure should be checked frequently.The use of steroids after cataract surgery may delay healing and increase the incidence of bleb formation.Use of ocular steroids may prolong the course and may exacerbate the severity of many viral infections of the eye (including herpes simplex). Employment of a corticosteroid medication in the treatment of patients with a history of herpes simplex requires great caution; frequent slit lamp microscopy is recommended. If inflammation or pain persists longer than 48 hours or becomes aggravated, the patient should be advised to discontinue use of the medication and consult a physician.This product is sterile when packaged. To prevent contamination, care should be taken to avoid touching the bottle tip to eyelids or to any other surface. The use of this bottle by more than one person may spread infection. Keep bottle tightly closed when not in use. Keep out of the reach of children.The preservative in fluorometholone ophthalmic suspension, benzalkonium chloride, may be absorbed by soft contact lenses. Patients wearing soft contact lenses should be instructed to wait at least 15 minutes after instilling fluorometholone ophthalmic suspension to insert soft contact lenses. No studies have been conducted in animals or in humans to evaluate the possibility of these effects with fluorometholone. Teratogenic effectsFluorometholone has been shown to be embryocidal and teratogenic in rabbits when administered at low multiples of the human ocular dose. Fluorometholone was applied ocularly to rabbits daily on days 6-18 of gestation, and dose-related fetal loss and fetal abnormalities including cleft palate, deformed rib cage, anomalous limbs and neural abnormalities such as encephalocele, craniorachischisis, and spina bifida were observed. There are no adequate and well-controlled studies of fluorometholone in pregnant women, and it is not known whether fluorometholone can cause fetal harm when administered to a pregnant woman. Fluorometholone should be used during pregnancy only if the potential benefit justifies the potential risk to the fetus. It is not known whether topical ophthalmic administration of corticosteroids could result in sufficient systemic absorption to produce detectable quantities in human milk. 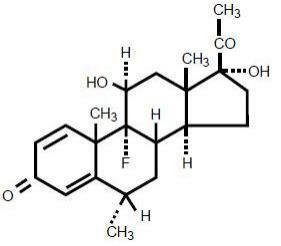 Systemically-administered corticosteroids appear in human milk and could suppress growth, interfere with endogenous corticosteroid production, or cause other untoward effects. Because of the potential for serious adverse reactions in nursing infants from fluorometholone, a decision should be made whether to discontinue nursing or to discontinue the drug, taking into account the importance of the drug to the mother. Safety and effectiveness in infants below the age of two years have not been established. Transient burning and stinging upon instillation and other minor symptoms of ocular irritation have been reported with the use of fluorometholone suspension. Other adverse events reported with the use of fluorometholone include: allergic reactions; foreign body sensation; erythema of eyelid; eyelid edema/eye swelling; eye discharge; eye pain; eye pruritus; lacrimation increased; rash; taste perversion; visual disturbance (blurry vision); and visual field defect. Shake well before using. Instill one drop into the conjunctival sac two to four times daily. During the initial 24 to 48 hours, the dosing frequency may be increased to one application every four hours. Care should be taken not to discontinue therapy prematurely. The dosing of fluorometholone ophthalmic suspension 0.1% may be reduced, but care should be taken not to discontinue therapy prematurely. In chronic conditions, withdrawal of treatment should be carried out by gradually decreasing the frequency of applications.